The journey through Winter Wonderland at the White House begins in the East Wing, where a family of snowmen aboard an antique sleigh awaits to greet and guide you through the East Colonnade. In the windows of the colonnade hang holiday wreaths trimmed with crystal ribbons and decorated with ornaments crafted by artists from across the country. As you enter the East Foyer, you will see a tree decorated with ornaments handcrafted by individuals in communities around the world where Peace Corps volunteers are serving. It represents the hope for international peace. Also in the East Foyer is an exhibit of White House Christmas Cards dating back to the Eisenhower Administration, featuring Ray Ellis's original watercolor "The White House, The State Dining Room," from which the official 1998 card was created. The painting reflects the newly refurbished State Dining Room. Upon passing through the doors to the Ground Floor Corridor, you will notice the lovely arches accented with fresh greenery and pine cones. The Library showcases two seven-foot-tall trees made of pine cones from all regions of the United States, graciously adorned with fruits and nuts. As you ascend the staircase and enter the East Room, an enchanted glittering wonderland awaits you. The eighteen soaring conical trees and a traditional Advent wreath were handmade with gold holly, shimmering white natural branches and assorted pine cones. 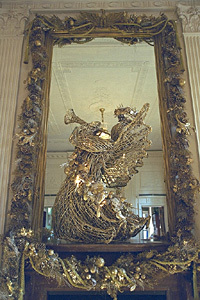 Each of the East Room's four mantels and mirrors is accented with a grapevine angel and draped with golden garlands. If holiday music nips at your ears, it is the musical groups from across the country who have been invited to fill the rooms with their joyous sounds. A focal point of the East Room is the beautiful White House croche with its 47 carved wood and terra-cotta figures. Made in Naples, Italy, in the late 18th century, the croche was a gift to the White House in 1967 and has been displayed every year.